This weeks draw was held in Julians Midfield and Mattie Carroll c/o Deirdre Carroll of Tullinacurra, Swinford won €609. Thanks to all our supporters. Envelopes are available in most business premises and online through www.swinfordgaa.ie where tickets can be purchased in bundles of 10/25/52 weeks. Next draw is in the Whitehouse on the 31st May. Draw envelopes are now also available at 3 for €5. We were beaten on a scoreline of Parke Keelogues Crimlin 0-13 Swinford 1-8 on Saturday evening in Parke. 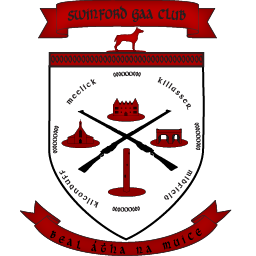 Full match report available on swinfordgaa.ie.